of her symbols is the cow. There are various stories of her associated with making of butter as well. One pious story tells that Brigid would divide the butter she churned into thirteen parts, one for each of the twelve apostles and one larger part of Our Lord, which she would distribute to the poor. When her druid master discovered her generosity with his goods, he came to the dairy to confront her. She welcomed him, washed his feet, and prepared food for him. He determined to test Brigid and commanded her to fill a great vessel with butter. Finding that she did not have enough butter to fulfill his request (because she had given so much to the needy), Brigid began to pray and through her prayers the butter multiplied in such large amounts that her druid master was brought to believe in Christ through the miracle. Making fresh butter is a fun endeavor for kids. It is also fairly simple. 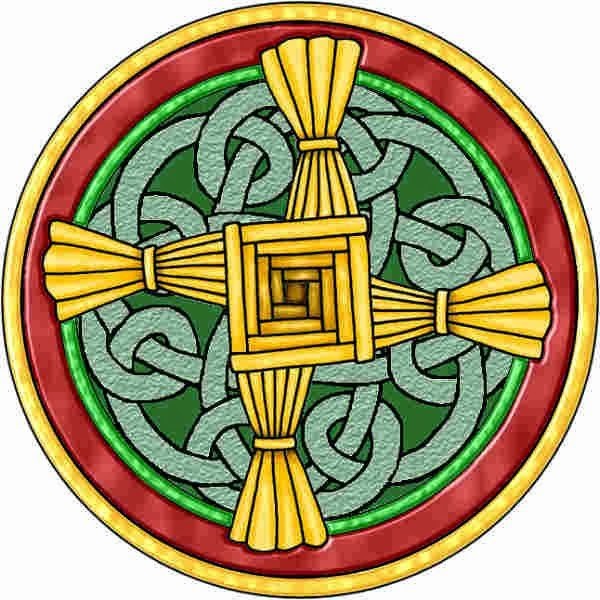 It would be a fitting activity to celebrate the feast of St. Brigid, the buttermaker. I like the good old-fashioned mason jar method. The only equipment needed is a large glass mason jar. It should be twice as large as the amount of cream you are shaking (ex: a quart jar for a pint of cream). In much of Europe, including France and Ireland, butter is cultured by adding live bacteria to cream before churning. Traditionally, U.S made butter isn't cultured and is known as sweet cream butter. I found some recipes where yogurt, with live bacteria cultures, is added to the cream and left to culture for a time before churning to produce a butter more like the cultured Irish butter. Whisk together half of the cream with the yogurt in a glass bowl until no lumps remain. Slowly whisk in the remaining cream. Cover the bowl with plastic wrap and set aside in a warm area for about 18 hours. When the cream is done “culturing,” it should smell and taste a bit tangy, like yogurt. Pour the cream into a mason jar. Cover tightly and shake vigorously. First the mixture will get foamy/frothy as it passes through the whipped cream stage. Continue shaking until a ball forms. That is the butter and the liquid remaining is the buttermilk (whey). The amount of time varies depending on how vigorously you shake the jar and how high the fat content of the cream is. The higher the fat content the shorter the shaking time (heavy whipping cream). Pour off the buttermilk (and save for cooking). Place the butter in another small bowl. In a different bowl, combine cold tap water with ice to make ice water. To rinse the butter pour some of ice water into your bowl with the butter and knead it with your hand. Pour off the murky water and add some more ice water. After several rinses, the water that comes off should be clear. And the butter will become more firm and stop sticking to your hands. Press all the water out and drain. Knead in about 1/4 teaspoon of salt, or more to taste. I used a Celtic gray sea salt. Scrape the butter into a ramekin or mold it into a block. Refrigerate for up to a week. Enjoy your fresh butter on any bread including these specifically Irish breads posted in earlier years: Traditional Irish Soda Bread or St. Brigid's Oaten Bread. Both of these recipes call for buttermilk, which would be a good use of the buttermilk you obtain from your butter making process. 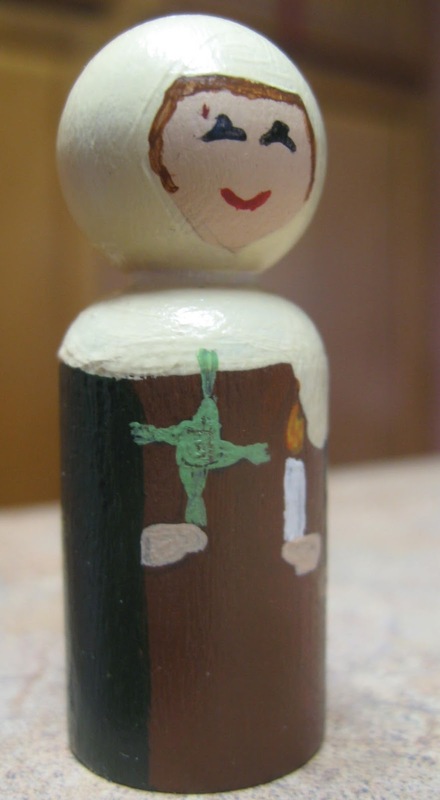 Edited to add: Here is a close up of our St. Brigid peg doll in case anyone wants details to paint own. Ragout is a thick, rich stew. Serving this lamb ragout over mashed potatoes creates a hearty meal for a cold January day, such as the feast of St. Agnes, January 21. I was particularly attracted to this version of a ragout recipe, as it is served over the mashed potatoes and the fluffy mashed potatoes remind me of lamb's wool - a fitting St. Agnes association to go along with the actual lamb roast. 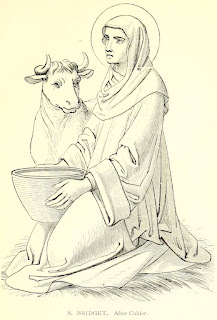 St. Agnes is typically pictured holding a lamb, and her name means lamb. Heat oil in Dutch oven over medium-high heat. Add stew meat and onion. Cook and stir occasionally until meat is browned. Add remaining ingredients (except mashed potatoes). Bring to a boil. Reduce heat to low; cover. Continue cooking about 2 hours until meat and vegetables are tender. Serve ragout over mashed potatoes in bowls. The following recipe for the Feast of the Baptism of the Lord was submitted by Tamalyn Lawrence. She shares that "It's very simple - blue water, sandy beaches, shells in the sand and blueberries for the river Jordan on top. Super easy and my kids really enjoyed it!" Thank you, Tamalyn! 1. Soften frozen ice cream or sherbet and spread in an 8x8 glass pan. Stir in blue food coloring and refreeze. "water"
2. Once ice cream has frozen, spread whipped topping across the top. 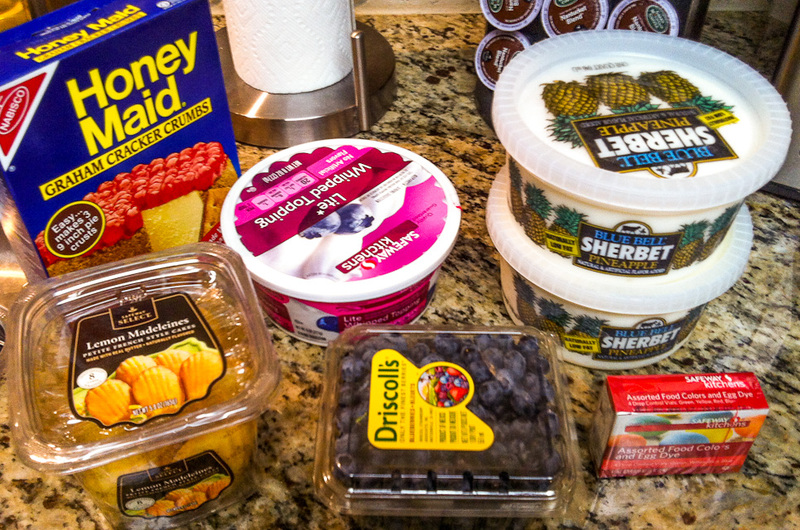 Return to freezer or go ahead and decorate now. 3. 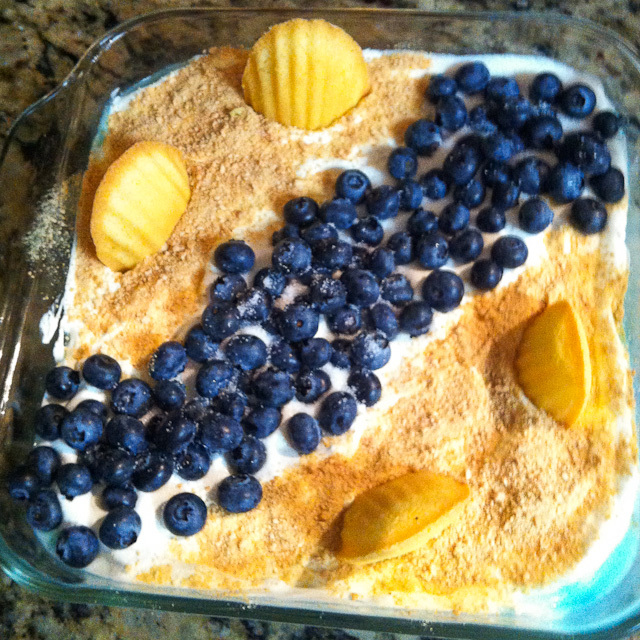 Sprinkle graham cracker crumbs on the corners to create the "sand", leaving a space in the middle. 4. Dot blueberries through the middle path to create the "River Jordan". Sprinkle white sugar on top of the blueberries. 5. Break madeleine cookies in half to push in the "sand" to make the "shells". Serve immediately (can be frozen, but blueberries will freeze). Note: Traditionally, the Feast of the Baptism of the Lord is celebrated on January 13, the octave day of Epiphany. In the current liturgical calendar, the Baptism of the Lord is celebrated on the Sunday after January 6, which will fall on January 10, 2016. John Nepomucene Neumann was born on March 28, 1811, in the village of Prachatitz in Bohemia which is now the Czech Republic. John, who had always been interested in being a missionary to America and came to the United States at age 25 and was ordained a priest in 1836. He served the Niagara frontier for several years. He joined the Redemptorists and professed vows in 1842 and was the first Redemptorist to be professed in the United States. Fr. John Neumann became a naturalized citizen of the United States in 1848. His ability to speak seven languages, German, Czech, English, French, Italian, Spanish and Gaelic helped him to serve his people. In 1852, he was appointed the 4th Bishop of Philadelphia. His first concern was always the immigrant children. He gave first priority to establishing schools and is credited with setting up the first system of diocesan parochial schools in the United States. Also during Neumann's administration, new parish churches were completed at the rate of approximately one per month. Bishop Neumann collapsed and died January 5, 1860. On June 19, 1977, John Nepomucene Neumann became America's third Roman Catholic saint, and the first American male saint. To remember St. John Neumann on his feast day, a beloved Bohemian pastry, kolaches, make a great treat. A kolache is a sweetened yeast pastry filled with a fruit, cream cheese, or a poppy seed filling. There are probably about as many variations as there are Czech grandmas. There are many different shapes, sizes and fillings. From rounds to folded pockets, hand sized to pie-sized, sweet to savory. Some raised, some not. Most seem to agree that the name “kolache” (or kolach, kolace, kolacky) comes from the Czech word for “cookie”. 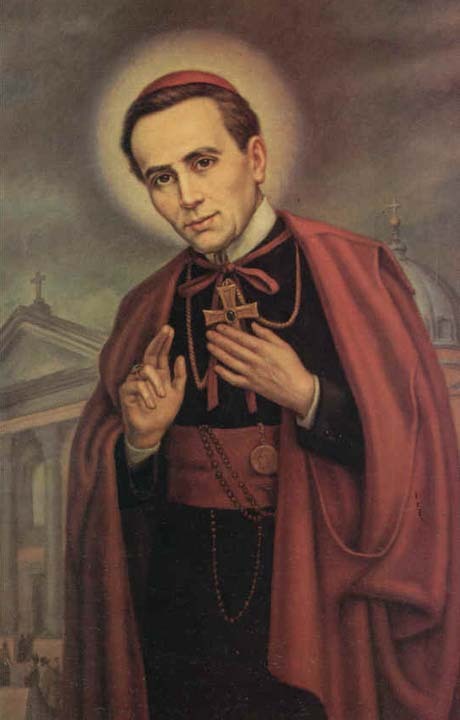 So I tried my hand at one variation in honor of the Bohemian to American saint, St. John Neumann. In a small bowl, dissolve yeast and 1 tablespoon sugar in warm milk; let stand 10 minutes. In large bowl, combine 2 cups flour, remaining sugar, eggs beaten, salt, butter and yeast/milk mixture. Mix until smooth. Add enough remaining flour to make a stiff dough. Turn out onto a floured surface and knead until smooth and elastic, about 6-8 minutes. Add additional flour, if necessary. Place dough in greased bowl, turning once to grease top. Cover; let rise in a warm place until doubled in bulk, about 1 hour. Roll the dough into balls. Place balls on pan lined with parchment paper and brush balls with melted oil. Let rise until dough is light (double height). Firmly press indentation in center and fill each roll with a heaping tablespoon of filling. Here is a link to recipes for several different fillings. Brush dough with egg white. Bake at 350° for 10-15 minutes or until rolls are light golden brown. Yield: about 28 rolls. May death still find us on the sure road to our Father's House with the light of living Faith in our hearts. Amen. It is interesting to discover the various traditions of the Christmas season from around the world. My interest in Italian culture increased this year since my daughter spent a semester abroad in Florence. The Italians have the tradition of La Befana, the old woman. In folklore, Befana visits all the children of Italy on the eve of Epiphany (Jan. 6th) to fill their socks with candy and presents if they are good or a lump of coal or dark candy if they are bad. The name Befana is derived from the word epifania, the Italian name for Epiphany (Greek). 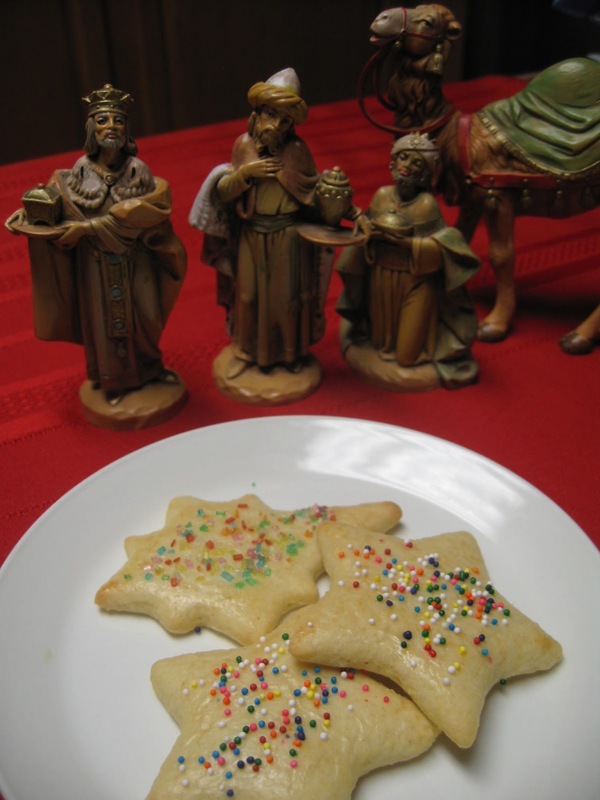 One traditional treat made for Epiphany in Italy, particularly Tuscany region, is a sugar cookie called Befanini. In mixing bowl, combine the flour and the sugar. Add the softened butter and mix. Add the eggs and continue mixing. Now add the lemon zest, the baking powder, the salt and the liqueur. Mix on medium speed adding the milk as necessary to make a smooth dough. Transfer the dough to floured pastry board and knead to form a ball. Wrap the dough and refrigerator for 30 minutes. Preheat oven at 350 degree. 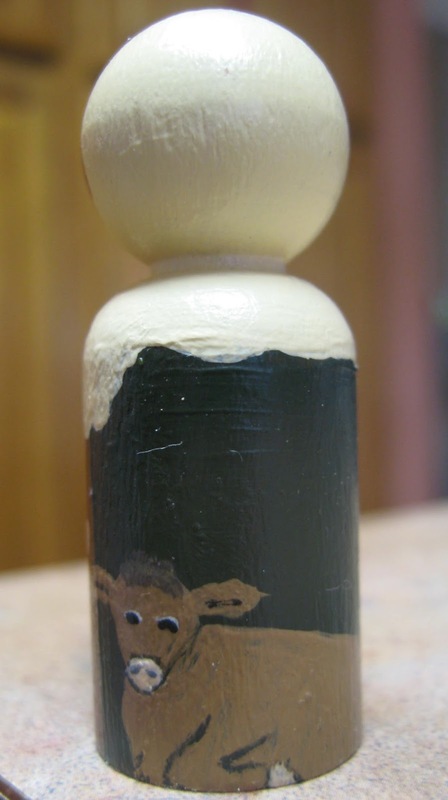 Add flour to working surface and around your rolling pin. Roll out the dough to 1/4 inch thick. Use cookie cutters in different shapes to cut your cookies. Stars are especially appropriate for Epiphany. Place on the cookie sheet lined with parchment paper. Make an egg wash with one egg and a bit of milk. Brush the cookies with the egg wash mixture and add sprinkles. Bake for 10-12 minutes at 350 until nice gold color. Remove from oven and transfer to a cooling rack. Makes about 5 dozen.